The Tory minister, speaking alongside Nato’s Secretary General Jens Stoltenberg, defended Britain’s nuclear deterrent. He appeared on Sky News from a nuclear submarine base in Scotland and insisted Nato weapons were “vital” for the security of member states. Mr Fallon said: “We remain committed to reducing our stockpile but we also have to be realistic – these weapons remain vital for the security of our people and of our Nato partners for as long as the security environment demands. “Nato is a nuclear alliance and our deterrent provides one of the alliance’s key centres of decision-making, complicating the calculations of our adversaries. 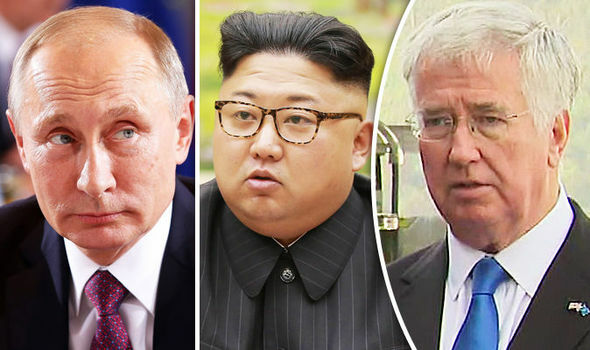 The politician then took aim at North Korea over its growing tensions with the US and South Korea and hit out at Russia over growing tensions in Eastern Europe. He said: “Today, the nuclear dangers are intensifying form a reckless North Korea and an increasingly aggressive Russia. The comments come after Donald Trump warned the United States is prepared to take "military action" to stop North Korea's threats. The US President said the move will be "devastating" for Pyongyang in a statement this week following the rogue state’s refusal to end its nuclear weapons programme. Asked whether he would consider sending the military into North Korea, Mr Trump, said: “We are totally prepared for the second option, not preferred, but it will be devastating, I can tell you that – that’s called the military option.